I returned from Hawai’i in mid-December with 700 bottles of seawater. The bottles hold what I hope are solutions to an abiding mystery. In the middle of the ocean, waters at depths ranging from 100 to 1,000 meters contain high concentrations of the toxic form of mercury that accumulates in fish. Nobody knows why it’s there or where it comes from. Mercury is unique among metals because it easily changes form between gas, liquid, and solid. It also exists in various chemical forms when it is dissolved in water. One of those forms is monomethylmercury, which is found at high concentrations in the tissue of some fish and can have detrimental health impacts on people. In particular, monomethylmercury hinders the neurological development of fetuses in pregnant women who eat large amounts of these fish. However, monomethylmercury is very different chemically from the elemental mercury that is released from the burning of coal. The pathway between smokestack and fish is full of mysteries. One mystery is where and how elemental mercury (Hg) takes on a methyl group (CH3) and is transformed into monomethylmercury (HgCH3) in marine environments. Scientists do not know whether the monomethylmercury in the open ocean is made on location or whether it is brought into the ocean from the shore by currents. The answer may lie within my bottles. Only a few scientists have measured monomethylmercury in the ocean, and they have found that the highest concentrations of monomethylmercury occur at mid-water ocean depths where oxygen concentrations are lowest. These low-oxygen zones are created when plants and animals that grow at the ocean surface die. They sink to mid-water depths and decompose, releasing large amounts of organic material to be recycled by marine bacteria. In that process, the bacteria use up oxygen. This creates a complex environment where many different factors could trigger mercury methylation. Scientists have found that in sediments near the coast where oxygen levels are low, bacteria convert mercury to monomethylmercury. Are bacteria making monomethylmercury in the ocean as they do closer to land? 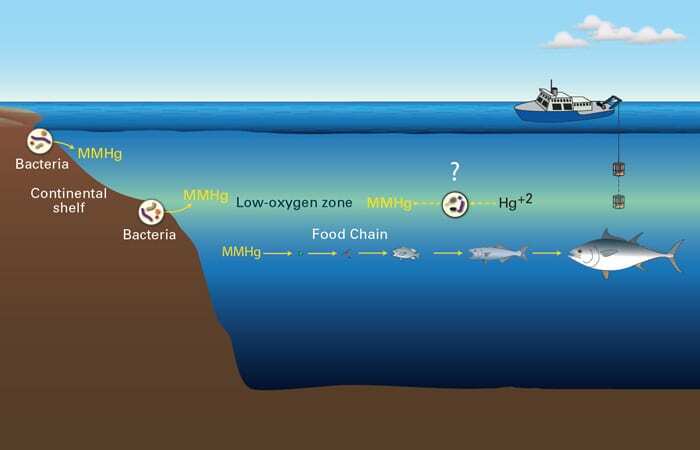 Are low oxygen concentrations at mid-water depths responsible for high amounts of monomethylmercury? Are the organic materials released by decomposition at these depths a key factor causing monomethylmercury production? Or is there a more complicated relationship: Do the bacteria that make monomethylmercury only survive in these low-oxygen depths where these materials are released? There certainly appears to be a relationship between the amounts of monomethylmercury, oxygen, and bacteria, but the list of questions we want to answer gets longer and longer the more we think about the intermingled processes that happen in the ocean. To begin to unravel them, we had to design experiments that would allow us to separate some of the possible controlling factors and examine them individually. The first hypothesis I wanted to explore is whether monomethylmercury, released into the water from coastal sediments, travels out into the open ocean from the coasts of continents. We cannot answer this question by measuring total amounts of monomethylmercury in the ocean as scientists have done in the past. That would not tell us where the monomethylmercury came from. Instead, I wanted to measure how fast monomethylmercury is made and how fast it is destroyed. Measuring rates allows me to determine how much of the total mercury we measure is made on site and how much is moved from other parts of the ocean. But where were the best locations to make our measurements to probe the relationship between low oxygen levels and high monomethylmercury levels? In October 2011, the research vessel Kilo Moana was headed from its homeport in Hawai’i to Samoa. That provided us with an ideal cruise track to collect seawater samples in a variety of mid-water low-oxygen zones that exist across 1,200 miles in the tropical Pacific Ocean. The lowest-level oxygen zone is found between 18°N and the equator; at 18°N, the low oxygen zone sat deepest in the water column. To compare what was going on in waters with low and high levels of oxygen, we collected samples from two depths—above and in the low-oxygen zones—at each of three locations: 18°N, the equator, and in between. Our next question was, what were the important measurements to take? From research in freshwater and coastal locations, we suspect that bacteria play a major role in producing monomethylmercury. Yet, in laboratory experiments, we can make monomethylmercury in the absence of any bacteria by mixing the vitamin B12 with inorganic mercury. In bacteria (as well as humans), vitamin B12 has an interesting capacity: It helps convey methyl groups between chemical compounds, including the methyl group that bonds with inorganic mercury to make monomethylmercury. Using vitamin B12, some bacteria in coastal sediments make monomethylmercury as an unintentional byproduct of their normal metabolism. So the goals of our experiments are to learn not only whether monomethylmercury is made in the open ocean, but also whether it is made inside bacterial cells or in the water outside of cells. In addition, we want to find out how important vitamin B12 is—with and without bacterial cells present—to the creation of monomethylmercury in the ocean. These comparisons required us to double the number of bottles we collected. Half were filled with water that was filtered to remove bacteria; the other half contained unfiltered water that still contained the bacteria that were present when the water was collected. We added vitamin B12 to samples with and without bacteria. Besides vitamin B12, other chemical compounds have special relationships with mercury, such as cysteine, an amino acid that is one of the building blocks of proteins. Cysteine contains the element sulfur, which binds tightly with mercury. Could bacteria taking in cysteine from surrounding waters also take in mercury? Would that create more opportunity for vitamin B12 or other compounds that move methyl groups to inadvertently methylate mercury? Scientists have tried to answer these questions in laboratory experiments in which they measure methylation in very controlled environments. But what happens when we try to measure this in the ocean, where many conditions cannot be controlled? 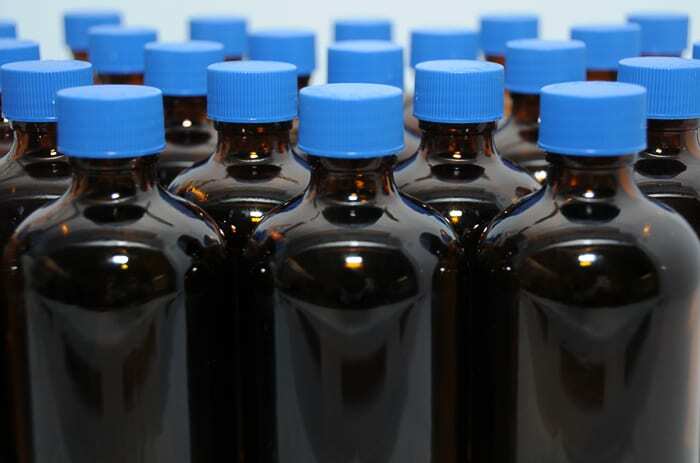 What happens is that the number of bottles you have to fill while at sea adds up very quickly in order to test the relative importance of all these factors—oxygen, bacteria, vitamin B12, and amino acids. Because we could not know in advance how important bacteria are to marine methylation, we have to test each compound that we think might play a role in both filtered and unfiltered water. At times the bottles seemed to multiply before our eyes. It took a lot of time and lots of help from others to fill each bottle with water, add mercury to measure rates of methylation, add various chemical compounds to test their importance, let the water react with those additions for a set amount of time, and preserve each sample. The samples were stored in refrigerators until the Kilo Moana returned to Hawai’i in December, where I unloaded them for transport back to Woods Hole Oceanographic Institution. But in many ways, those were the easy parts. Now, with 700 bottles to analyze using a new instrument that arrived in our lab just before the bottles did, the real work begins! This research was funded by the National Science Foundation and by an NSF Graduate Research Fellowship to Kathleen Munson. How Does Mercury Get into Fish?